A few weeks ago, we learned that Skechers had filmed a Super Bowl ad at Tucson Greyhound Park. Tucson is one of the worst dog tracks in the country, and earlier this year was referred to as a "black mark" on the community in an Arizona Daily Star column. After hearing from people all over the world the shoe company appears to be backpedaling, and has told us "we don't even know if that footage we (sic) ever appear in a commercial." This is a step in the right direction, but is not good enough. Meanwhile, we have received evidence of two new cases of neglect that occurred at Tucson Greyhound Park. Both of these cases occurred only weeks before the Skechers ad shoot, and should give them pause. According to the Arizona Department of Racing, a greyhound trainer named Willie Davis was fined $1,000 by the state for "failing to turn out and care for the greyhounds" in the kennel he worked in on September 28. According to state records, the dogs were not let out of their cages to relieve themselves for at least eight hours before a state investigator discovered the problem. Three days later on October 1, another trainer at Tucson Greyhound Park was fined $100 after he brought four greyhounds to race with an "excessive amount of fleas." Thankfully, state officials did not allow the dogs to compete. In June, a kennel inspection report documented poor conditions including "floors filthy (urine & feces)/refridgerator covered inside and out with blood (from meat)." 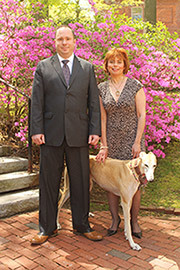 When he was confronted, the trainer responsible for the kennel "could not produce a log" indicating the ultimate fate of greyhounds that had previously raced and refused to sign the inspection report. Last year, GREY2K USA investigators gained access to the Tucson Greyhound Park kennel compound and documented the conditions in which dogs live. Hundreds of greyhounds live in darkness, kept confined in small cages and most of the dogs are muzzled. When track General Manager Tom Taylor was asked about our footage, his bizarre defense included the statement that the track is an "ideal place for dogs." Taylor also claimed that he "could show you a picture of the Mona Lisa and you could say 'Oh, that's horrible.'" Taylor did admit, however, that he would not allow his pet dog to live in the track kennel compound. 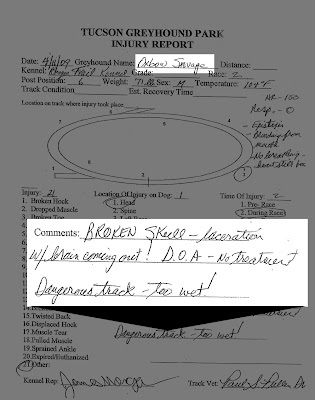 Independently of GREY2K USA, nearly identical kennel conditions at the track were documented in 2010 and 2011 by a Pima County investigator. In February, we released a Report on Greyhound Racing in Arizona that documented a wide range humane problems at Tucson Greyhound Park. Some of these problems include female greyhounds being given anabolic steroids, cases of neglect, unsanitary conditions, trainers testing positive for illegal drugs, dogs dying while being transported, and greyhounds suffering from various illnesses. In addition, nearly three hundred greyhound injuries have been reported at Tucson Greyhound Park since 2007, including dogs that suffered broken legs and other serious injuries such as a broken skull. Tucson Greyhound Park has an extensive record of cruelty, which is why it is so hard to understand why Skechers would partner with this notorious track. I can only assume that Skechers was not aware of the track's chronic problems. Skechers must now make a decision. I am hopeful the company will make the humane choice, and announce it will not run any ad that was filmed at Tucson Greyhound Park. If Skechers insists on moving forward, we have secured the domain www.BoycottSkechers.com and are prepared to take our campaign to a whole new level. Stay tuned. I do not understand why Arizona continues to let racing continue at this park after so many documented cases of neglect? I sincerely hope that sketchers pulls its ad, and I would encourage Sketchers and everyone else, to write the governor and close this track. These precious pups need to be treated with respect and love. It's amazing that there hasn't been more done to stop these trainers from practicing and more investigations at this track....the track is responsible for what goes on as well as the trainers...fine the track owners and see who pays attention then. Just all you animal lovers out there, don't buy Sketchers shoes. I have a pair but if reading this article first, I wouldn't of bought them. With all theses problems at this place and its not shut down,I'd like to see the trainers go to jail for the cruel acts up on the animals,we need tougher laws, that's what needs done,making all animals abuse a felonies,and higher fines and longer jail sentencing,and have a judge who specializing in this field,treat the animals like people,and if you injure and kill a animal,then you can do 25 to life for this offense,they have feelings and they hurt just like us we can try to defend our selves but animals can't. I rescued a retired racer. When I look at her, into her eyes, I cannot but wonder what mis-treatment she has suffered. It makes me sick to think that these beautiful, gentle dogs are being used to death. STOP RACING NOW!!! Boycott Skechers!! Don't wear the shoes. Send them back to the company along with a letter explaining the reason why you're choosing to no longer wear them or buy any in the future. You are promoting Sketchers by wearing them. I send letters to all companies that I learn about that are abusing animals for any reason telling them that unless they stop I not only will not buy their products, I will convince many others not to buy them. My Mom always said there were three ways to get the word out in this world...telegraph. telephone and TELL A WOMAN!!! Right now I'm wearing tenth pair of Sketchers, but they will be my last pair if they run this commercial. NB will be back in the picture.